(CNN) -- King Nut Companies issued a total recall of peanut butter that it distributes Saturday amid fears of a salmonella outbreak that the Centers for Disease Control and Prevention said has infected 399 people in 42 states. Ohio-based King Nut acknowledged in a statement that salmonella had been found in an open 5-pound tub of King Nut peanut butter. "We are very sorry this happened," Martin Kanan, president of King Nut Companies, said in the statement. "We are taking immediate and voluntary action because the health and safety of those who use our products is always our highest priority." King Nut peanut butter was identified as the source of an outbreak that may have contributed to one death in Minnesota, state public health officials said Friday. King Nut said Saturday that peanut butter sold under its label was manufactured by Peanut Corporation of America. The release gave no other details on the manufacturer, but Peanut Corporation of America's Web site lists its headquarters as Lynchburg, Virginia, and says it has processing operations in Virginia, Georgia and Texas. Peanut Corporation of America could not be immediately reached for comment. The first cases were reported September 3, but most cases occurred between October 1 and December 31, the CDC said. About 18 percent of victims were hospitalized as a result of their illness, and patients' ages have ranged from 2 months to 98 years. California is reporting the highest case count, with 55, followed by Ohio with 53 cases, Massachusetts with 39, Minnesota with 30 and Michigan with 20. The other 37 states are each reporting fewer than 20 cases. Eight states have reported no cases connected to the outbreak. They are Montana, New Mexico, Louisiana, Mississippi, South Carolina, Florida, Alaska and Hawaii. In its statement, King Nut said it distributes peanut butter "only through food service accounts. It is not sold directly to consumers." The statement added, "King Nut does not supply any of the ingredients for the peanut butter distributed under its label. All other King Nut products are safe and not included in this voluntary recall." 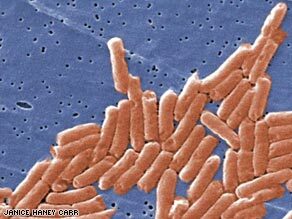 Strains of salmonella linked to previous outbreaks have been traced to contaminated eggs, meat, poultry, vegetables, pet food and peanut butter. Salmonella infections can be treated with antibiotics, though some strains are resistant to these drugs, according to the CDC. Most people infected develop diarrhea, fever and abdominal cramps within a few days of infection, and their illness can last up to a week. Most recover without treatment, but some may suffer dehydration and, in severe cases, require hospitalization. Children, senior citizens, people with chronic illnesses and those with weak immune systems tend to be at highest risk for complications, according to the National Institutes of Health.